Very cool! Just drive that baby! I got out to the garage last night to simply put my curtains back up so I can weld and grind without having to move my Gran Sport out of the garage. I am going to get out to that garage for 5 minutes every day, sometimes it's something like this, other times it turns into a few hours. But damn it, if I get out there I will get SOMETHING done! I am a California woosy and have a hard time taking that 40 degree garage! I also had to pay tribute to Pete Chapouris who died yesterday. Damn it's hard to hear that he passed away. I was of the era that changed because of him. That magazine, the first time we saw "The California Kid" and Jakes "Screaming Yellow Zonker" OMG I studied every page of that magazine like I had studied no book in school EVER. I have it hanging up in my garage, now it's there for a different reason. Just do it Brian....it was -1f here this morning. Would look forward to your updates. Didn't know that about Pete. A loss....I remember that issue and just ordered California Kid movie in November. Thanks for the link and the cowl photos Martinsr. that was what I was wanting and real close to how I figured I'd do mine. As far as what I got done on the truck today I got my son to run up and pick up the 9 inch rear I bought a couple of weeks ago. Dang those are heavy when they are all together. Now to go back out and finish getting the snow blower back together so I can use it in the morning. I got some welding done on the patch I have been working on. I can't get it all done being the garage is detached and I have to stay out there quite a while after the last weld to be sure nothing is going to start a fire. So I welded these welds then studied the other side to see what I will do there and a few other things and thinking out what I will do. ANYTHING you do is better than nothing so just looking is better than staying in the house and having a beer. Brian, first let me say that I'm sorry to hear that Pete C. has died. As a long time car magazine reader his name is very familiar, and what hot rodder hasn't lusted over the "California Kid". Here's a couple of R&C magazines that I still have. You might remember these from 1958 and 1959. It makes me smile to see the difference in quality of the cars then and now. These are the small ones, BTW. 5 by 8 inches. I believe I have that issue on the left. Oh heck yeah we have spent a lot of time staring at those magazines. I got the patch done! WHOOO HOOOOO! Took me a week but to get it in but that's a hell of a lot more done to the truck in the previous two years so I am feeling good. Worked on tailgate/roll pan fitment today. Brian, did you gas weld that? It would be pretty interesting if you had a build thread going for your updates. Yeah, I maybe I can start one. I MIGGED this particular thing. I am gas welding some stuff but that's only if I can get behind it to plannish it nice. Done, got a build thread started. 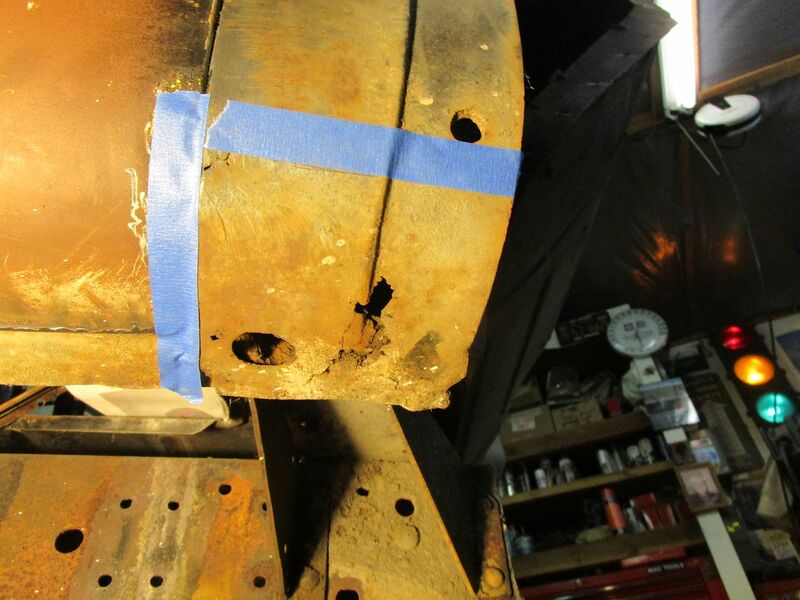 I got another rusted through section cut out on the bottom of the cowl. I also cut a slit up the cowl at the door edge to widen the gap little. I will fine tune it when I do the welding of the patch. The last two nights I have been out in the garage Which is better than nothing at least the truck is sitting there and I am connected a little. As I hadn't been doing anything out there for the last few years. But I have a project I have to finish for my brother's Crosley Motorcycle he is building as I have a deadline I have been ignoring. I worked on the radiator box for it. But I could have lied and said it was the heater box for the truck. nice work, gotta love those looooong vice grips. isn't it funny how everybody else's project deadline seems to trump our's? and how nobody ever has time to help with our project but we are expected to drop it all and work on their emergency? I have 37 pairs of vice grips in my tool box, so I have about every one they make. Put the ole 55 to work today. Doing a very large siding job up here in Maine. Took my '56 out of the garage so I could see how the 1.5 inch drop springs and 2in drop spindles look, also decided to sweep the floor before I put her back inside! What did I do? Well I found more rust that I have to cut out, crap. It's right at the bottom of the side of the cowl at the bottom where the fender wraps around by the running board. I will be making everything from scratch. 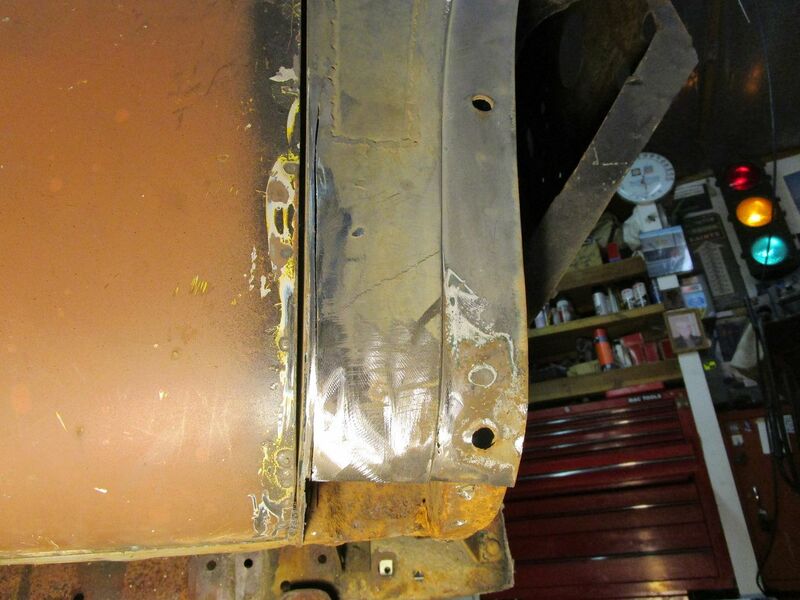 I am not going off making large pieces, just patching the rust through areas. It's solid right next to that.